A search operation for three missing Irish Coast Guard crew members will continue overnight following a helicopter crash off the coast of Co Mayo early this morning, in which Captain Dara Fitzpatrick died. Rescue 116 with four crew on board lost contact around 1am. Capt Fitzpatrick was transferred to Mayo University Hospital after being recovered from the water in a critical condition by an RNLI lifeboat crew, but was later pronounced dead. Search and Rescue operations manager with the Irish Coast Guard Gerard O'Flynn said the surface search is likely to continue overnight, but the air search will be scaled down until first light tomorrow. The Marine Institute's research vessel, RV Celtic Voyager, has joined the search operation. It is equipped with multi-beam radar, normally used for mapping the seabed. Rescue 116 was providing cover for another Coast Guard helicopter on a mission at the time of the crash. Captain Fitzpatrick was a senior pilot with the Coast Guard and had over 20 years' experience. Mr O'Flynn said the news of her death was a hammer blow to the emergency services. The mother of a young son, Capt Fitzpatrick was a well-known member of the Coast Guard service and was also involved in several water safety campaigns. She was recognised with honours for her bravery and earned a place in the aviation history books. Just three years ago, she was one of two female Coast Guard pilots who carried out the first all-woman mission for the service. The pair flew a cardiac patient from west Co Cork to Cork University Hospital before transferring a critically-ill five-year-old child from the hospital to Temple Street Children's Hospital in Dublin. 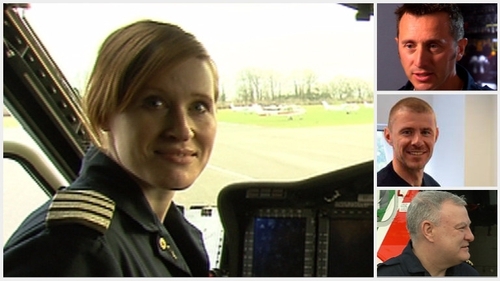 She was known for her starring role in Rescue 117, a fly-on-the-wall documentary series on RTÉ, given behind the scenes access to the helicopter search and rescue service. She had also spent a year long stint in Aberdeen flying onto oil rigs. As well as her son, she is survived by three sisters, a brother and her parents. Mr Flynn said there was no prior warning before Rescue 116 went missing. He said there has been no indication about what happened, and that the Air Accident Investigation Unit will be conducting a full investigation into the incident. "This was a shock, the helicopter just simply disappeared. Communications was lost. Once communications was lost, an emergency procedure was initiated, a search was immediately initiated. But it was just a sudden break in communication and there was no prior warning of any particular problem," he said. Rescue personnel say small amounts of debris have been found on the sea surface. It is understood that a fuel tank from the missing helicopter may have been located. Speaking on RTÉ's Morning Ireland, Director of the Irish Coast Guard Eugene Clonan said that while the search for three missing crew members continues, hopes of finding them are fading. He said the last communication with Rescue 116 was at 12.45am when it said it was approaching Blacksod to refuel (after providing support to Rescue 118) and there was no indication of any problem. When Rescue 116 failed to respond after a communications search, a search began. The first search and rescue unit on scene was Rescue 118 from Sligo, and that crew discovered debris on the surface of the water about 1.5 nautical miles southeast of Blackrock lighthouse, around six nautical miles off the coast from Blacksod. Mr Clonan said visibility last night "wasn't too good" but suitable for carrying out the operation. He said Rescue 116 is a very new aircraft, a Sikorsky S92, and has had regular maintenance checks. Search and rescue helicopters from Sligo and Shannon are involved in the search, along with an Air Corps plane, lifeboats from Ballyglass and Achill and five local fishing boats. In a statement earlier this morning, the Coast Guard said the Sligo-based Rescue 118 helicopter completed an evacuation of a crewman requiring urgent medical attention from a UK-registered fishing vessel 150 nautical miles west of Eagle Island in Co Mayo early this morning. "Owing to the distance involved, safety and communication support, known as top cover, was provided by the second Coast Guard helicopter, the Dublin-based Rescue 116," the statement said. The S92 helicopter is one of four in operation around the Irish coast, with a fifth kept in reserve. AAIU chief aeronautical officer Jurgen Whyte said investigators were en route within an hour of the incident. They have since arrived on the scene. Speaking at a news conference this morning, he said the immediate priority is the search and rescue effort, then the collection of debris and to recover the flight recorders. Mr Conlan said today was "a dark day for the Coast Guard and rescue services."